Another exciting duo session from Francois Houle. This time he collides with versatile stylings of pianist, Havard Wiik. Together they emerge with the sublime, Aves. This is well crafted, well improvised session that melds classical and free jazz into a harmonious celebration. "Nomenclatural" starts off quietly with a heavy melody that soon builds into a series of rolling counterpoints. Wiik and Houle seem to challenge each other at very turn with improvised notes that both offset and combine for a lovely high energy experience. "Ged's Shadow" and "Letter for Gregory L" focus more on the simply sparse notes laid out by Wiik. Very emotional and dense, which allows the listener to sink deeply into their own darkness. Houle can be hear deep in the background (except towards the latter passages of Gregory) which makes both piece even more eerie and effective. "Woodhoopoe" sees Houle playing various notes in a pattern which felt like a mixture of both classical, free form and African. There was beat that develops but more effectively "Woodhoopoe" doesn't feel like Houle on clarinet. It was reminiscent of recent work by Colin Stetson and his rotating breathing effects. A great solo piece. I am a huge fan of Francois Houle and get excited by each release. 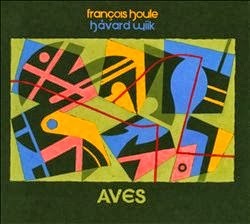 With Aves, It feels as though his met another kinder counterpart along the lines of fellow collaborator, Benoit Delbecq that he can bounce ideas off. And the results is another fantastic and invigorating session that is well worth every one's time to seek out. Highly Recommended.